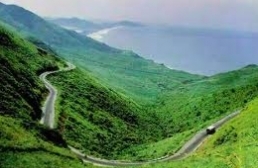 Vietnam's topography is very diverse with mountains, hills, plains, coasts and continental shelf. It's result of tectonic process in a long time of millions of years in the past. The topography is lower from the northwest to the southeast. Thus, almost the rivers in Vietnam have the stream following that direction. Mountains and hills, which occupy three quarters of Vietnam’s territory, are the main landscape in Vietnam. However, 85% among them are low mountains and hills under 1,000 meters high. There are only 1% of mountains that have the height over 2,000 meters. In northeastern Vietnam, there are several mountain ranges (such as Song Gam, Ngan Son, Bac Son and Dong Trieu) forming the shape of a bow. In northwestern Vietnam, high mountains and highland are the dominant scenery. This region is also location of the highest mountain of Vietnam – Fansipan (3,143 meters high), which is dubbed "the Roof of Indochina". In the central of the Northern part of Vietnam is the Red River Delta, one of two biggest plains in Vietnam. The Central Vietnam has the largest difference in height between the east and the west. The west is featured with high mountain range of Truong Son and Tay Nguyen’s highlands, while the east has various small plains along the coast. In Southern Vietnam, topography is quite simple with Mekong Delta, the largest plain of Vietnam (or “Nine Dragon River Delta”). Mekong Delta covers an area of 40,000 square kilometers in total and is the main rice-cultivating area of Vietnam. Vietnam’s territory on the sea is featured with variety of islands with both small and big size. The gulf of Tonkin, in particular, comprises more than 3,000 islands, which belong to Halong Bay, Bai Tu Long Bay, Cat Ba Island, Bach Long Vi Island, etc. The two biggest archipelagos of Vietnam are Truong Sa Archipelago (Spratly Islands) and Hoang Sa Archipelago (Paracel Islands).